It’s an exciting time in particle physics. Puzzles abound. There are hints of things that don’t fit with scientists’ best model of the universe—and researchers are taking inspiration from one another as they investigate them all. One recent example comes from the Deep Underground Neutrino Experiment, an international megascience project with more than 1100 scientists from 32 countries. It's hosted by the Department of Energy’s Fermi National Accelerator Laboratory in Batavia, Illinois. Fermilab will send a beam of particles called neutrinos straight through 800 miles (1300 km) of earth to a huge particle detector—four modules holding 70,000 total tons of liquid argon—to be housed at the Sanford Underground Research Facility in South Dakota. Scientists hope to learn more about the properties of these mysterious particles, which might have something to do with why matter exists. 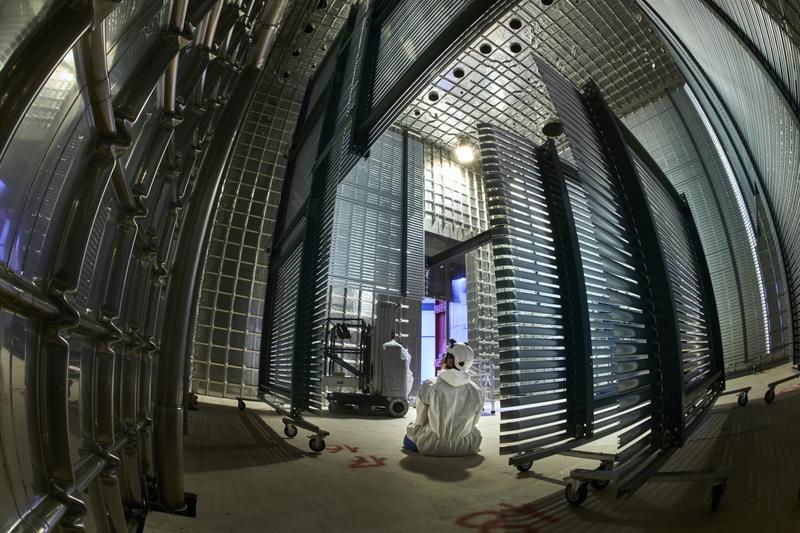 One of the prototypes for the huge DUNE detector modules will use a concept that’s relatively new for neutrino science but familiar to researchers from other parts of particle physics: the dual-phase detector. Matter comes in different phases, the most familiar of which are solid, liquid and gas. All dual-phase particle detectors to date have one thing in common: They use a combination of liquid and gas phases. This will also be true for DUNE, whose dual-phase module of liquid and gaseous argon will make it the largest dual-phase detector ever created when it comes online in the mid-2020s. Dual-phase detectors can record a particle interaction twice: first when the collision occurs in the liquid, creating a flash of light, and again when the resulting spray of particles enters the area filled with gas and produces even more signals. Having these two indicators allows for an especially precise and clear reconstruction of the original interaction. 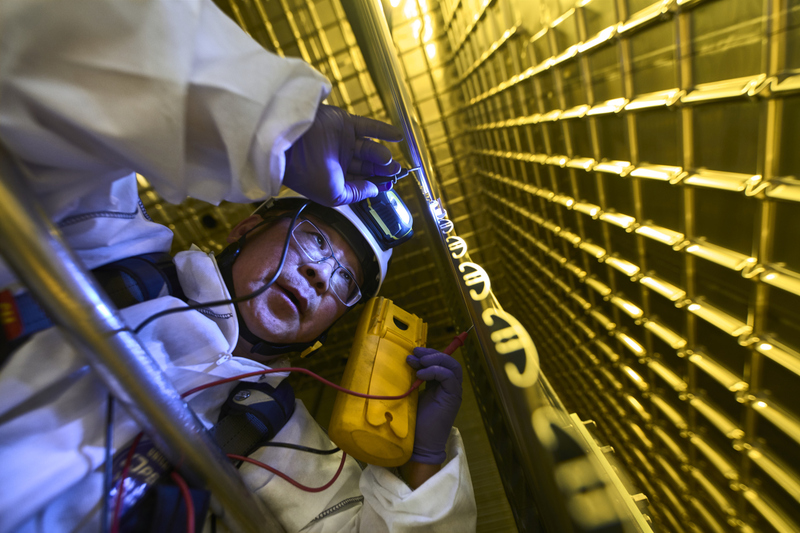 Researcher Jae Yu checks components within the dual-phase ProtoDUNE detector. Neutrino experiments using dual-phase technology have started cropping up only in the past few years, but it’s been an industry standard for dark matter experiments for much longer. Neutrinos and dark matter are two of the biggest mysteries in particle physics today. Neutrinos rarely interact with matter, and it took about 25 years from the theoretical “invention” of neutrinos to their actual detection in 1956. Today, neutrinos intrigue scientists with their tiny yet unexpected masses and their ability to morph between at least three different types as they travel throughout the universe. Dark matter has never been directly observed, but scientists infer the existence of these proposed particles from indirect evidence such as the unlikely speed at which galaxies spin without coming apart. Dual-phase technology for dark matter detectors, originally proposed in the 1970s, is well established and has helped produce leading dark matter results for the past decade, says Cristian Galbiati, a physicist at Princeton and spokesperson for the DarkSide-50 dark matter experiment currently collecting data at INFN’s Gran Sasso National Laboratory in Italy. Like DUNE, DarkSide uses argon as a detection medium. But each experiment faces its own particular challenges. For one, unlike DUNE, DarkSide must have no background noise—signals that could be misinterpreted as a dark matter particle discovery. This means that the experiment has to use argon with very low radioactivity, specially procured and distilled from an underground source in Colorado. It will also be true for the next generation of the experiment, DarkSide-20k, which will require 20 tons of the ultrapure argon. Researchers working on multiple small-scale dark matter detectors that use argon, including DEAP 3600, ARDM, MiniCLEAN, and DarkSide-50, have joined together and formed the Global Dark Matter Argon Collaboration to work on that next-generation detector, scheduled to come online at Gran Sasso in 2022. It will be followed by an even larger version around 2027. Argon isn’t the only game in town. Other dual-phase dark matter detectors use different noble gases, such as the xenon in LUX or the next-generation LUX-ZEPLIN experiment. LZ will use 10 tons of the material and should see “first dark” in 2020. Photomultiplier tubes, which collect light, were installed in this frame for the LUX dark matter experiment. DUNE will make use of both single-phase and dual-phase detector modules at the experiment’s far site in South Dakota. Single-phase argon technology, which uses only liquid argon, has already been demonstrated in short-distance neutrino experiments—like MicroBooNE at Fermilab, which uses a school-bus-sized detector—and in long-distance experiments—like ICARUS, a 760-ton detector that previously operated at Gran Sasso using a neutrino beam that traveled 450 miles (725 km) from CERN, the European Center for Nuclear Research. And dual-phase neutrino tech made significant progress with the WA105 3X1X1 detector. Nevertheless, when you’re building up to something as big as DUNE, you want to run tests to make sure everything works as expected. 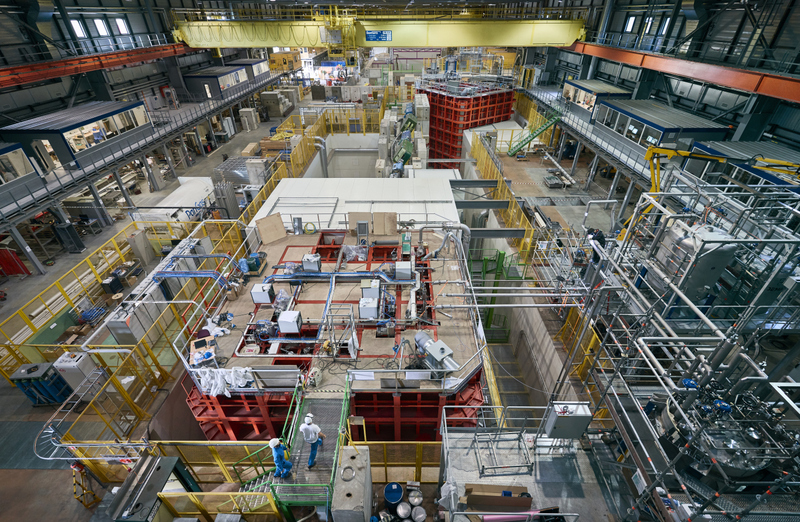 To that end, collaborators are building enormous single-phase and dual-phase testbeds called the ProtoDUNE detectors at CERN. At the laboratory's new neutrino platform, led by Marzio Nessi, scientists are now completing the two 800-ton detectors to give the technologies for DUNE a final test. The two ProtoDUNE detectors are housed at CERN's neutrino platform. 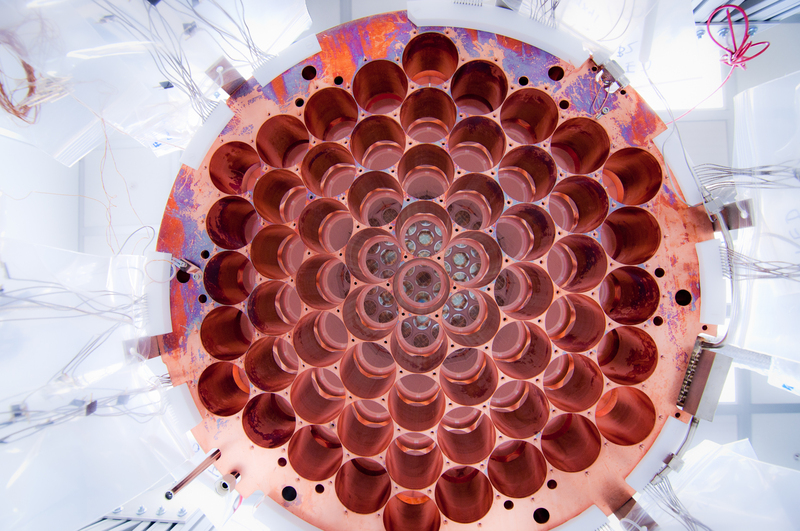 The single-phase prototype should finish filling with liquid argon and be commissioned by the end of summer, seeing first particle tracks in the fall. The dual-phase prototype recently finished the first test of a key component called the charge readout plane, or CRP, which will amplify the electrons into the gas and collect their signals. The CRPs and other components should be installed this fall. Some of the advantages of using the dual-phase technology are, compared to the single-phase setup, stronger and cleaner signals and a lower energy threshold, meaning the detector can see lower-energy neutrinos. Amplifying the electrons in the gas makes the signal stand out from background noise. Single-phase detectors try to collect the signal as soon as possible, meaning the electronics are usually inside the detector, within the liquid argon at a cryogenic temperature. In contrast, the dual-phase detector's electronics will be housed in special chimneys that are accessible from the outside. Another bonus: almost all of the liquid argon inside the dual-phase detector is one large, signal-producing region, making the data analysis less complicated. In contrast, single-phase detectors are segmented into chunks, meaning the different sections later have to be combined together for data analysis, and gaps accounted for. A person in cleanroom garb sits inside the dual-phase ProtoDUNE detector. But with those benefits come challenges for the dual-phase design of DUNE. The cathode of the field cage—the electrical component which draws the electrons towards the signal-recording pieces—must be operated at a mind-boggling voltage of around 600,000 volts. In addition, the CRPs must lie perfectly level at the border of the liquid and gas phases of argon and function stably, without sparking. The overlap between dual-phase technologies for dark matter and neutrino experiments will continue for the foreseeable future. The Global Argon Dark Matter Collaboration already is looking at the design of the ProtoDUNE cryostat as a potential casing for their 20-ton experiment, and ProtoDUNE collaborators are looking at how the dual-phase prototype detector could be used to look for a particular kind of dark matter.